Happy Wednesday friends! Slam dunked with another busy week on my end so just want to say hope you're having a great week! Your earrings are so pretty :-) I like how you paired olive with black and ivory. You look great! love that army green skirt, it's so unique, and i love how you did your hair! xO! Love the little pops of color! That green skirt is perfection and I love how all the elements of this outfit are working together. You look beautiful! Very pretty top and earrings! Love the outfit and your earring are stunning! This is a very pretty blouse! I love it paired with the olive skirt! Lovely outfit, and your accessories are knocking it out of the park!!! Those earrings are wonderful! and the shoes are fab! stylish in sequins | Enter our $25 Jemesuis Vintage Giveaway! 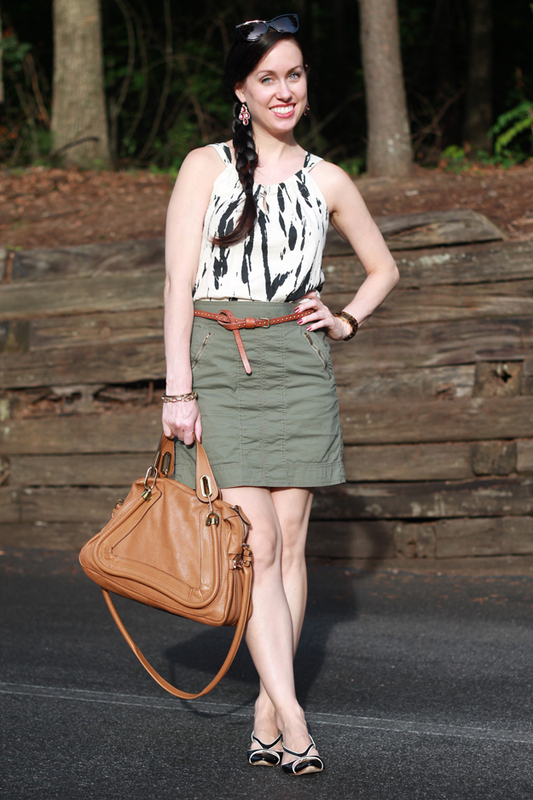 Super cute safari look! I love how relaxed this is, but how your accessories and nails make it super ladylike too. You're the queen of always being feminine. Cute lunching with girls outfit!! Gorgeous look! And I LOVE those earrings! Anyway, you have such a great blog! What do you think of following each other? Fabulous outfit! I really LOVE that top! I can't believe it's from Old Navy! Those earrings are so pretty, and of course, that bag is amazing! Such a lovely outfit. I love olive. Oh that bag. I dream of that bag! !